In a parking lot where 18 refrigerated trailers hold the remains of World Trade Center victims, hundreds of family members and those working to identify the dead will quietly mark the Sept. 11 anniversary. The trailers outside the medical examiner's office have become a sacred spot for families who hope their relatives will be identified. Of the 2,801 people listed as dead or missing, 1,400 had been identified as of Monday. "This has been a healing experience," a woman who lost her husband wrote in a message book for victims' families. "May his soul and all the souls of the faithful departed rest in peace." Families must schedule visits, and hundreds signed up for hour-long sessions Wednesday at the site they have dubbed "Memorial Park." 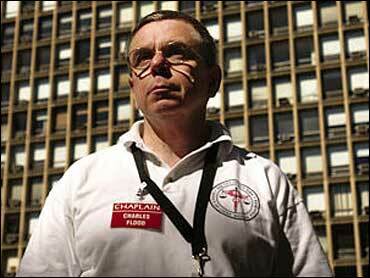 Chaplains have been there for nearly a year, since the body parts began arriving by the truckload. Under the direction of the Revs. Charles Flood and Betsee Parker, the chaplaincy program has evolved into a full-time operation, with its own trailer, a Web site and a staff of eight volunteer clergy to greet visiting family members. They also talk with workers in the labs not far from the trailers holding more than 19,000 body parts. Flood, rector of the Episcopalian St. Stephen's church in Philadelphia, pays for his commute and much of the program out of his own pocket. He plans to be there for at least three more years. "The family members say they're going to be coming here for a very long time," said Flood, 58. "But if family visitations stop, we're going to keep a presence here. I cannot imagine having 19,000 body parts sitting here in what is called Memorial Park, with no religious presence." Immediately after the attack, when ambulances arrived with the bodies of uniformed rescue workers, the staff lined up and the on-duty chaplain laid a hand on the remains with a silent prayer. In January, Flood was asked to create a weekly ceremony that would honor civilian victims and give the staff time to reflect on the momentous task. He wrote several interfaith prayers and purchased 19 lanterns - one for each trailer, plus another for remains not found. "It was just a chance to stop and reflect, because people were working such long shifts," said Donna Fisk, a volunteer who was in charge of Memorial Park for eight months. "Some people would stand around and cry. Some people would hug each other. They just needed that release." The service under the tent in Memorial Park now draws regulars, who each week still place the lanterns in front of the trailers. Among them is Howard Cash, president of Gene Codes Corp., which developed software for DNA matching. Cash said he tries to attend the service each Friday. "Standing in that very respectful and spiritual place, you really feel the presence of all these people, and there's always that feeling that everyone there is saying 'Don't give up, here I am,"' Cash said. "It makes it easier to push on to the next week and do it all again."